It was a mixed weekend of action for Stenhousemuir with both sides recording league wins on Saturday before the first team were defeated in the Challenge Cup semi final on the Sunday. It was a familiar pattern at Whitehaugh in the league, bowling the opposition out and struggling to make runs. Kelburne batted first and were soon 23 for 3 with Zeb Alamgir taking two wickets and Rushdie Jappie one. In the only substantial partnership of the innings, Andrew Miller and Willie Allan took the score up to 85 when Gary Halcrow caught Miller off his own bowling for 25. He then caught Allan off the bowling of Sohail Thakur also for 25, his third catch of the innings. Thereafter the Kelburne innings subsided and although the main wicket takers were Zeb Alamgir and Rushdie Jappie with three each, it was Halcrow and Thakur who made the vital breakthrough. Skipper Ross Jones picked up one wicket and there was a run out, leaving Kelburne all out for 131. This was no great total to chase but ‘Muir made hard work of it. They were 25 for four with Kieran Simpson, Ross Jones, Callum Grant and Rushdie Jappie all back in the hutch. That they won the match was almost entirely due to Talor Scott who, with help from Zeb Alamgir who made 11 and Gary Halcrow with 9, saw the side home with a fine innings of 67 not out. 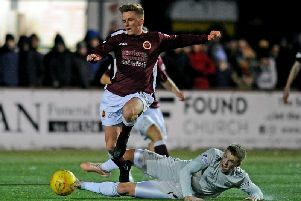 Stenhousemuir, though, were well beaten at Falkland on Sunday in the semi final of the Challenge Cup. Fakland made 190 for 6 off 40 overs. Rushdie Jappie took 4 wickets and Sohail Thakur and Callum Grant one each. ‘Muir were all out for 70. Callum Grant made 23, Zeb Alamgir 18 and Ross Jones 13. The second team beat Glenpark at the Tryst. The Greenock side made 122 all out. Alan Reed took four wickets, Lewis Ollier three and Naimh Robertson-Jack, Peter Quinn and Chris Dyer one each. Stenhousemuir made the winning runs for the loss of four wickets. Scott Bain made 35, Peter Moses 18 not out, Chris Halcrow 18, Peter Quinn 13 and Connon McLaren 7 not out.